I apologize in advance, but the blog will be a little lean this week. (Lean as in, not a lot of posts....not lean as in healthy...we already established that with the pound of potatoes I ate yesterday). The reason? I'm taking my talents to South Beach. (Don't worry...I'll be back). Yup, I'm going to Miami Wednesday night to celebrate my friend Kim and her last few weeks as a single lady. (Kim made the beautiful Upside Down Cake a couple weeks back). Kim is originally from Florida, so her one request on our trip is to eat some Cuban food. One of her favorite things is yellow rice, or Arroz Amarillo. Well, since it's "Y week," I figured what better way to get us primed for our trip than with some traditional Yellow Rice. Fortunately, I had Kim as a resource on this one because there are quite a few variations of this dish online. First, cut it in half lengthwise. Then, cut off just the tip (insert Wedding Crashers joke here) and peel back the top layer. Second, make one slice in the middle, taking care not to completely slice all the way through. 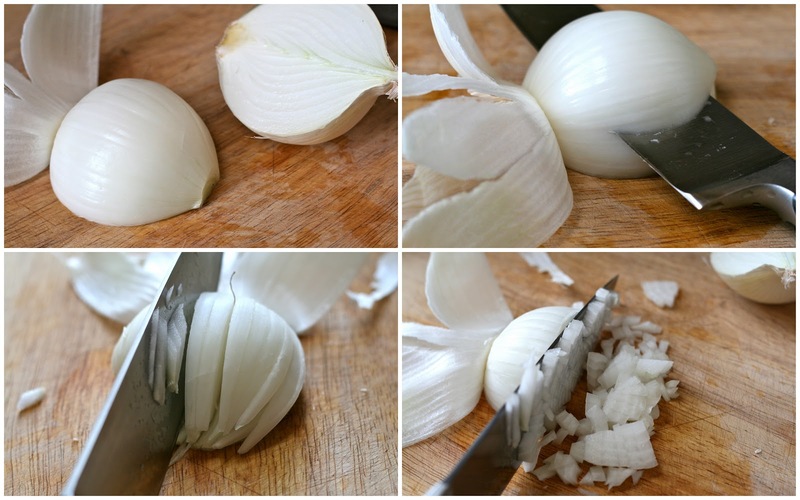 Third, using the little lines in the onion as guides, make even slices. (Again, making sure not to slice all the way to the back). From there, you can make your final chops. And voila! Evenly diced onion. You can of course make this on the stove, but I prefer my Zojirushi rice cooker. Up until about 8 months ago, I never even considered needing or wanting a rice maker. But thanks to my cousin Erin's persuasive convincing, I asked for this for my birthday last year. (Yes, I'm a dork and ask for kitchen appliances for my birthday). Wow. I'm in love. This thing is the best. Makes perfect rice every time. I'm not quite sure how I ever made rice without it. It has this technology called "Fuzzy Logic." I don't really know how it works, but I find it magical. Only adding to the magic is that it plays "Twinkle, Twinkle, Little Star" when you turn it on. (No, seriously.) But enough about my love affair with the rice machine....on to the arroz. You'll need some long grain, white rice. I went with Basmati because it's what I had in my fridge (and I love the way it smells when it's cooking). I also prefer to rinse my rice. There's a couple schools of thought regarding this, but I personally think it tastes and cooks better. The photo on the left shows you what the water looks like without rinsing. Super cloudy, right? The one on the right is after about 4 quick rinses. So, do whatever you prefer, but my vote is for rinsing. (Unless you are using enriched or rinse-free rice...in that case, no rinsing required). The other cool thing about the rice cooker is you can do everything right in the pot. Put a tablespoon of oil in the bowl and turn the machine to the regular cycle. Once oil is warm, add the garlic, chopped onion and rice and allow to cook until onion is soft, about five minutes. While the onions are cooking, dissolve a pinch of saffron threads into warmed chicken broth. I never really know how much a pinch is...and looking at this photo, it looks like a little more than a pinch, but oh well. A lot of recipes I found online called for achiote paste, bijol or annatto seeds....so use whatever is more convenient. Saffron is actually the most expensive of the bunch, but I happened to have some in my spice drawer. Whatever you use will help turn it the yellow color this dish is known for. I also added a half teaspoon of tumeric and some salt. From there, just add the broth to the rice and let the rice machine do the magic! (A note about how much broth or water to use...I usually err on the side of less because I don't like mushy rice. For a cup of dry Basmati, I would use anywhere between 1 1/4 to 1 1/2 cups of liquid. But use your own judgement, and when in doubt, follow whatever it says on your package of rice). Put a tablespoon of oil in the bowl of rice cooker and turn the machine to the regular cycle. Once oil is warm, add the garlic, chopped onion and rice and allow to cook until onion is soft, about five minutes. Warm chicken broth in the microwave for about 60 seconds. Dissolve saffron threads in broth, and stir in tumeric and season with salt to taste. Stir roasted chiles into rice (if using) and pour in the chicken broth mixture. When machine switches to "warm," stir in chopped cilantro (if using) and allow to steam 5-10 minutes longer.